In the film, the beloved garden gnomes from Gnomeo and Juliet are back for a whole new adventure in London. When Gnomeo and Juliet first arrive in the city with their friends and family, their biggest concern is getting their new garden ready for spring. However, they soon discover that someone is kidnapping garden gnomes all over London. When Gnomeo and Juliet return home to find that everyone in their garden is missing – there’s only one gnome to call SHERLOCK GNOMES. The famous detective and sworn protector of London’s garden gnomes arrives with his sidekick Watson to investigate the case. The mystery will lead our gnomes on a rollicking adventure where they will meet all new ornaments and explore an undiscovered side of the city. Sherlock Gnomes is based on Characters by Rob Sprackling, John Smith, Andy Riley, Kevin Cecil, Keely Asbury and Steve Hamilton Shaw. 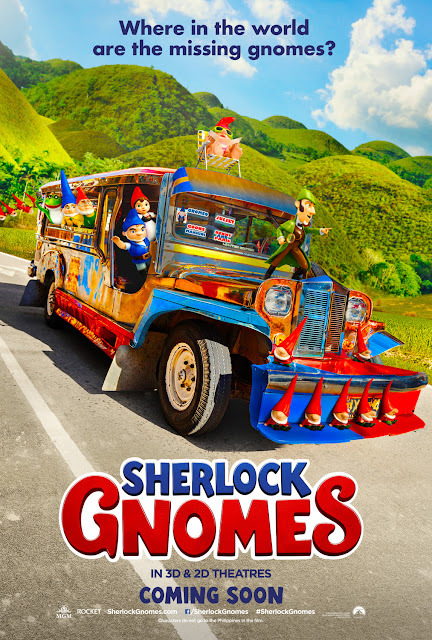 "Sherlock Gnomes" is distributed in the Philippines by United International Pictures through Columbia Pictures and watch "Sherlock Gnomes" in cinemas March 21.